GMO crops are grown around the world by approximately 18 million farmers, most of them in developing countries. In total, more than 75 countries import, grow and/or research GMOs, and in 2016, 26 countries (seven industrial and 19 developing) planted biotech crops. As of 2016, the top five countries growing GMOs in terms of crop area are the United States, Brazil, Argentina, Canada and India. 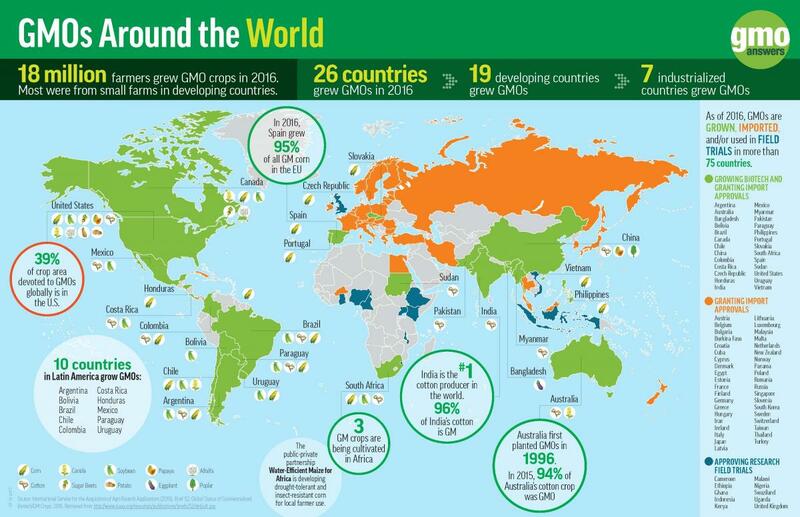 Here is a guide to where GMOs are being grown and reviewed for approval around the world. Africa faces the dual challenges of having the highest rate of population growth compared to the rest of the world – expected to increase from 926 million to 2.2 billion by 2050 - in addition to being the continent most vulnerable to impacts from climate change. These circumstances will further burden Africa’s small-holder farmers already struggling to feed their families with the additional challenge of increasing yields by up to 80 percent to meet escalating demand. Genetically engineered crops developed to solve production problems specific to developing countries can help to improve yields, enable farmers to adopt more sustainable agricultural practices, and improve farmers’ and their families’ livelihoods. According to ISAAA, South Africa is one of the top ten developing countries to plant biotech crops, growing GM maize, soybeans and cotton on nearly 6.6 million acres in 2016. These GM varieties represent approximately 90, 95 and 100 percent of total crop plantings, respectively. In 2015, South Africa planting biotech crops led to $237 million in economic gains. During the same year Sudan grew over 296,000 acres of GM cotton. Twelve other countries – Burkina Faso, Cameroon, Ethiopia, Ghana, Kenya, Malawi, Mozambique, Nigeria, South Africa, Swaziland, Tanzania and Uganda – have been conducting field trials on crops with traits related to drought-tolerance, saline-tolerance, nitrogen use efficiency, and enhanced nutrient content. The Water Efficient Maize for Africa (WEMA) initiative, a public-private partnership supported by the Gates Foundation, Howard G. Buffett Foundation and USAID, has been working to develop drought-tolerant maize, the most cultivated staple crop throughout Africa. WEMA researchers are utilizing conventional breeding, marker assisted breeding and genetic engineering technologies to improve locally grown varieties. Researchers are also adding, or “stacking,” insect-resistance with the drought-tolerance trait so that farmers can address multiple challenges with one seed, and it is anticipated these seeds will be made widely available to farmers in 2018. Conventional drought-tolerant maize hybrids developed by WEMA already have been grown by farmers in Kenya, Tanzania, Uganda and South Africa, resulting in greater yields compared to other varieties. In addition to maize, research and development led by the African Agricultural Technology Foundation (AATF) is ongoing to improve other staple crops in Africa, including cowpea and rice. Cowpea (also known as field pea or black-eyed pea), according to CGIAR, is a protein-rich grain that is vital for the nutrition and livelihoods of millions of people in sub-Saharan Africa, and also serves as a food source for livestock. Scientists in Nigeria, Ghana and Burkina Faso are working to develop a Bt cowpea that is resistant to the pod borer insect, which can devastate up to 90 percent of a farmer’s crop. Scientists are also using genetic engineering to enhance the nutritional value of some staple crops in order to address malnutrition in many developing country populations. Read more about this potentially life-saving application in our section: Improving Nutrition in the Developing World. Eight Asian countries planted biotech crops in 2016, with the world’s number one cotton producer, India, leading Pakistan, China, Australia, Philippines, Myanmar, Vietnam and Bangladesh in overall GM production. In addition, although not a cultivator of biotech food crops, Japan has been growing the biotech blue rose since 2011. With cumulative production across the region in 2016 at nearly 46 million acres and enhanced economic benefit in 2015 at $2.9 billion, several governments are committed to further expanding biotech crop production in the future. In India, virtually all cotton grown in the country is genetically modified. Since 2002, the adoption rate of insect-resistant cotton has increased to 96 percent with over 7 million farmers planting the crop across the country. Since the first biotech cotton plantings, the cumulative economic benefit from biotech production has been $19.6 billion, with $1.3 billion in 2015 alone. Although the leading cotton producer globally, India has not yet grown GMO crops for food. Research in this area is ongoing, however, with the government conducting field trials for GM cowpea, chickpea and mustard. In May 2017, India’s Ministry of the Environment Genetic Engineering Appraisal Committee concluded that the publicly funded GM mustard is safe and nutritious, bringing the crop closer to approval and commercialization for food use. India does import significant quantities of GM soy oil and canola oil for human consumption. Pakistan is another notable cotton producer, with 97 percent of its cotton GMO varieties. In 2016, over seven million acres of GM cotton were cultivated by 725,000 smallholder farmers. Pakistan exports its cotton to other Asian countries, including India, Indonesia, Thailand and Taiwan. The enhanced economic benefit of biotech production between 2010 and 2015 is $4.3 billion, and the increased cotton production has generated additional jobs for farm laborers, particularly benefiting women. Like India, Pakistan has yet to adopt GMO food crops for cultivation but is conducting experimental and field trial research on a number of biotech crops, including maize, wheat, rice, sugarcane, chickpea, potato and ground nut, as well as tobacco. Pakistan is a major importer of GM soy and canola oil in addition to importing GM cotton. While China continues to be the largest importer of biotech crops globally, the Chinese government is focused on increasing its domestic product pipeline and crop production. Since 1994, China has approved 60 biotech events for food, feed and processing. In 2016, China cultivated 6.9 million acres of GMO cotton, papaya and poplar, the latter used for timber. Farmer adoption rates for these crops are 90, 95 and 100 percent for papaya, cotton and poplar respectively. Growing insect-resistant cotton has increased average yields by 10 percent, reduced insecticide use by 60 percent, and increased farm income by $18.6 billion since 1998, $1 billion in 2015 alone. A key element of China’s economic development plan is increasing its domestic research and development. China’s government has provided $3 billion in funding to grow its biotech industry, and is conducting research on wheat, rice, maize, soybeans and peanuts. Currently, China is conducting field trials on insect-resistant and herbicide-tolerant maize, and both phytase maize and insect-resistant rice varieties are awaiting approval. Australia ranks 12th globally in biotech crops production, growing GMO cotton and canola on 2.1 million acres in 2016. Since its original plantings in 1996, farmer adoption of biotech cotton has grown to 98 percent. Adoption for GM canola is at 23 percent. To date Australia has approved 119 biotech events. The economic benefit of growing biotech crops is estimated to be $1 billion between 1996 and 2015. Research and field trials are being conducted on several plant varieties, including bananas, barley, canola, cotton, grapes, Indian mustard, maize, papaya, perennial ryegrass, pineapple, safflower, sugarcane, tall fescue, torenia, wheat, and white clover. Over 400,000 Filipino farmers grew two million acres of maize in 2016, accounting for 65 percent of Philippines’ maize production. Since originally planting biotech maize in 2003, the cumulative economic benefit is approximately $642 million, $82 million in 2015. 88 biotech events have been approved in the Philippines, and a number of products developed with public-private sector support are at or near the field trial stage, including Golden Rice, insect-resistant brinjal and cotton, and virus-resistant papaya. In 2016, Myanmar grew over 800,000 acres of insect-resistant cotton, with the adoption rate at 93 percent. Over 460,000 smallholder farmers have benefitted from this crop, with enhanced farm income between 2008 and 2015 at $308 million. 2015 is the first year in which Vietnam cultivated biotech crops, growing genetically modified maize. In 2016, farmers grew insect-resistant and herbicide-tolerant maize on 86,000 acres and realized increased yields between 16.5 and 25 percent compared to non-GM varieties. Vietnam has approved 22 biotech events, and imports GMO maize, soy, cotton, canola and alfalfa. In addition, field trials have been approved for GMO maize, soy and cotton varieties. Genetically modified brinjal (eggplant) is the Bangladesh’s first genetically modified crop that protects brinjal from the deadly fruit and shoot borer. Cultivation in 2016 of the insect-resistant brinjal increased 28-fold over 2015 to 1700 acres. The insect-resistant trait helped to save farmers $120 per hectare (2.7 acres) by significantly lowering pesticide applications by 70 to 90 percent, and increasing yield by 30 percent. The estimated economic benefit per hectare is over $1800. There is ongoing research and field trials for new varieties of insect-resistant brinjal. The Bangladesh Agricultural Research Institute is also working to develop GM potato, rice, cotton and tomato. Canada and the United States are two of the original six countries to begin planting GMO crops in 1996. (The other four are Argentina, Australia, China and Mexico.) Since these first plantings, up to 10 biotech crops have been produced on hundreds of million acres across both nations, with the cumulative economic benefit from biotech crops netted between 1996 and 2015 over $80 billion. Among the 26 countries growing GMO crops in 2016, Canada ranks fourth in production, cultivating canola, corn, soy, sugarbeets and alfalfa on 28.5 million acres. Farmer adoption of the top three crops – canola, corn and soy - is 93 percent, 92 percent, and 94 percent, respectively. CropLife Canada estimates that the use of biotech crops and pesticides has enabled farmers to produce 47 percent more grain worth an added CA$ 9.8 billion on an annual basis. Originally developed in Canada in the 1960s and 70s, canola (an abbreviation of “Canadian oil”) is a variety of rapeseed in which the erucic acid and glucosinolate content must be below specified levels. Erucic acid, though not a safety concern at normal consumption rates, has been shown to have toxic effects at high enough levels. Canola oil is used in a wide variety of food and industrial products, such as salad oil, shortening, spreads and creamers, as well as printing ink, plastics and cosmetics. Canada, fittingly, was the first country to commercialize herbicide-tolerant canola in 1996 and exports 85 percent of its canola crop to China, Japan, Mexico and the U.S.
To date, Canada has approved 171 biotech traits for food, feed and cultivation, including the non-browning/low-bruising potato and the non-browning apple, which was developed by Okanagan Specialty Fruit (OSF) based in British Columbia, Canada. It is anticipated that farmers will begin growing the GM potato in 2017, and introduction of the GMO apple to the Canadian market is currently under review. The United States is the largest producer of genetically modified crops in the world, planting 39 percent of total global production. In 2016 farmers in the U.S. grew GMO corn, cotton, soybeans, canola, sugarbeets, alfalfa, papaya, potatoes and summer squash on over 180 million acres. In the 20 years of commercialization of biotech crops (1996-2015), the United States accrued the highest benefits at $72.9 billion and $6.9 billion for 2015 alone. Farmer adoption rates for the major biotech commodity crops in 2016 were 92 percent for corn, 94 percent for soybeans, 93 percent for cotton, 90 percent for canola and 100 percent for sugarbeets. According to USDA the U.S. is the world’s largest agricultural exporter, and a majority of the corn and soy products exported abroad are biotech varieties. Both the EU and China are major markets for U.S. grain exports, with an estimated 6.5 million tons of soybeans exported to the EU and 85 million tons of soybeans and 3.17 million tons of corn exported to China in 2016-2017. Like Canada, two of the most recently approved crops are the GMO non-browning and low-bruising Innate® potato and the non-browning Arctic® apple. These two crops were developed to encourage less food waste from the farm to the kitchen table. It is estimated that approximately 133 billion pounds of food is wasted annually in the U.S., much of that waste from discarded fruits and vegetables. In 2016 farmers planted over 6000 acres of the GM Innate® potato. This biotech potato also has reduced amounts of asparagine, which when cooked at high temperatures, forms acrylamide, a potential carcinogen. A second generation Innate® potato with the same traits as the first generation plus late blight resistance and reduced sugars also has received approval from U.S. regulatory agencies. Late blight is the fungal disease that led to the Great Irish Famine in the 19th century and still affects farmers around the world today. The biotech Arctic® apple varieties were first commercially harvested in 2016 and is now available for sale in the U.S. The Arctic® apple’s non-browning trait ensures the apple will not brown if it is cut, bitten or bruised, encouraging growers, packers, retailers and consumers alike to waste less fruit due to superficial discoloration. Field trials are currently being conducted on two other tree species, both under attack from diseases. In the early 20th century the American chestnut was devastated by chestnut blight, a fungal disease that eradicated the hardwood tree from East Coast forests. Researchers at SUNY-ESF have been working to develop a blight-resistant American chestnut, incorporating resistance genes from the Chinese chestnut. Based on successful field trials, these researchers estimate that the biotech American chestnut could be commercially available for planting in four years. 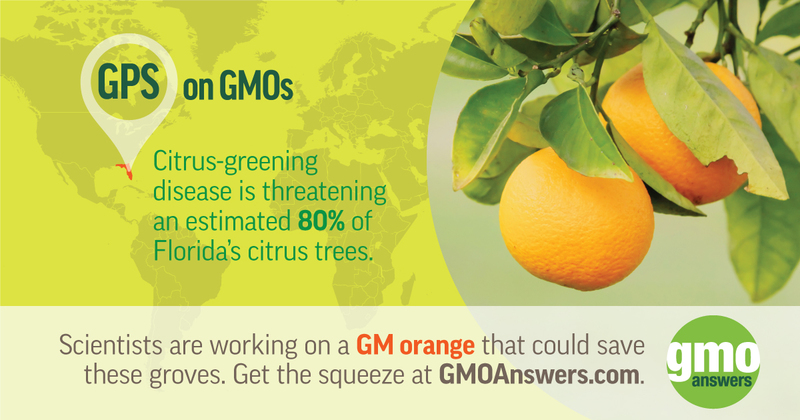 Citrus greening, another plant disease, is decimating Florida’s $5.1 billion citrus industry. Over 80 percent of Florida growers’ production has been affected. Texas A&M University scientists, with support from Southern Gardens, have been developing a disease-resistant citrus tree that utilizes a gene from spinach to confer resistance. Following successful field trials, Southern Gardens is looking to gain approval for the disease-resistant tree that could be available for planting in three to four years. Canada and the U.S. have approved the AquAdvantage salmon. The AquAdvantage salmon grows to market size in 18 months as opposed to the normal growth rate of three years and uses 25 percent less feed. Regulatory agencies in both countries have confirmed the GM salmon to be as safe and nutritious as non-GM salmon already on the market. Despite the confirmed safety of biotech crops by the EC, European Academy of Sciences, and the European Food Safety Authority (EFSA), public anti-GMO sentiment remains prevalent throughout the EU, impacting the rate of approvals for new GM crops and farmers’ access to biotech seeds. The EU, however, continues to import vast amounts of GMO grains for livestock, and farmers in four EU countries grow GMO maize. The United Kingdom (UK) is steadily moving closer to cultivation, conducting research and development on GM crop varieties, in addition to receiving support from outspoken public figures. In the EU, all GMO crops for importation or cultivation undergo a thorough risk assessment by EFSA. To date, EFSA has approved 95 events and consistently confirmed the safety of all GMO crops on the market. Nonetheless, in late 2015 19 of the 25 EU countries voted to opt out of cultivating biotech crops. Currently, four European countries – Spain, Portugal, Czech Republic and Slovakia –plant genetically modified maize, nearly 337,000 acres in 2016, where it is used primarily in livestock feed. While some individual nations do not allow for cultivation, the EU remains one of the largest importers of biotech grains for livestock feed and industrial uses. EU livestock farmers rely on imports for 70 percent of their grain needs, including up to 34 million tons of GMO soy. EuropaBio notes that stopping imports of GM feed to Europe would result in 30 billion euros in economic losses annually. Although the UK has yet to approve a biotech crop for cultivation, the UK is leading Europe in innovative agriculture biotechnology research, and government and other public figures continue to speak out in support of GMO crops. UK’s Rothamsted Research is the oldest running agricultural research station in the world. Rothamsted scientists have been working to develop a genetically engineered wheat variety modified to carry out photosynthesis more efficiently. Another project undergoing field trials at Rothamsted is GM Camelina that is enhanced to produce heart healthy Omega-3 oils, potentially providing a more sustainable plant source for Omega-3’s than fish stocks. Additionally, Rothamsted, in partnership with Seed Co Ltd in Africa, is testing an insect-resistant biotech wheat variety to assist small-holder farmers in Africa. This GM wheat is being developed to repel aphids, including the Russian Wheat Aphid that can decimate up to 80 percent of a vulnerable crop. As a block Latin American countries are powerhouse producers of GMO crops, with 10 countries growing over 197 million acres of maize, soybeans, cotton and canola in 2016. Brazil leads Latin American nations in cultivation and exports, followed by Argentina. Bolivia, Chile, Colombia, Costa Rica, Honduras, Mexico, Paraguay and Uruguay too grow GMO varieties. Latin American countries also are biotechnology innovators, developing local GM crops, often as an outcome of public-private partnerships. Since 1998 Brazil has approved 72 biotech traits, and ISAAA cites that economic benefits to farmers planting biotech crops between 2003 and 2015 are $16.4 billion. In 2016 Brazil grew over 121 million acres of GM soybeans, maize and cotton and is a leading exporter in all three crops. Both China and the European Union import biotech cotton and soybeans from Brazil, and GM maize is exported from Brazil to Iran and Asian countries. Although not yet commercially available to farmers, Brazil has approved a biotech higher-yield eucalyptus for bioindustrial usage, as well as a GMO virus-resistant bean and an herbicide-tolerant soybean. Private sector companies, BASF and the Center of Technology in Sugarcane, working with the public institution EMBRAPA, the Brazilian Agricultural Research Corporation, have been developing and testing an herbicide-tolerant soybean and drought-tolerant sugarcane, respectively. Oxitec, in partnership with the University of Sao Paolo, commercialized a genetically engineered mosquito that is modified to help fight devastating tropical diseases, such as Zika virus and Dengue, Yellow, and Chikungunya Fever. Second after Brazil, Argentina has approved 47 biotech traits and produced nearly 59 million acres of GM maize, soybeans and cotton in 2016. Over the 20 years of planting, GM production has increased Argentina farm income by approximately over $21 billion. Argentina is the largest producer of soybean meal globally, with nearly 100 percent of their crop biotech soybeans, and exporting nearly 11 MMT. Argentina approved two local GM crops in 2015, a virus-resistant potato and a publicly-developed drought-tolerant soybean. Both the public and private sectors are working to develop future biotech varieties of wheat, rice, sugarcane, potatoes, papaya and citrus. Eight other Latin American countries - Bolivia, Chile, Colombia, Costa Rica, Honduras, Mexico, Uruguay and Paraguay – also cultivate GMO food and horticulture crops, including maize, cotton, canola, soybeans, carnations and roses. Between 2008 and 2016, GM soybean cultivation in Bolivia has doubled to nearly three million acres, elevating Bolivia as the ninth largest soybean producer in the world and increasing farmer economic benefits by $722 million. Bolivia’s crop is exported to other Latin American countries, including Ecuador, Peru and Venezuela. Currently, Chile grows approximately 26,000 acres of GM maize, canola and soybeans only for seed for export. Chile ranks fifth worldwide in overall seed production and first in GM seed production, with most of its GM seeds exported to the United States and Canada. Despite the prohibition to grow GM crops for internal consumption, Chile imports GM grains for livestock feed and processed food products containing GMO ingredients. There are several public research projects in Chile to develop genetically engineered varieties of local crops. The Catholic University of Santiago is developing drought-tolerant citrus and virus-resistant potatoes. The Chilean Research Institute is researching drought-tolerant eucalyptus. And, there are a number of projects related to grapes that could contribute to Chile’s wine industry, including grapes resistant to Botrytis, also known as Noble Rot, and powdery mildew disease. Colombia produced nearly 272,000 acres of GM maize and cotton in 2016, and since GM plantings began in 2004, farm income has increased by $153 million. Colombia also grows genetically engineered Dutch blue carnations for export to Europe and GM blue petal roses for export to Japan, where one rose can retail for up to $50. There are numerous ongoing public and private research projects to develop genetically engineered varieties of cassava, coffee, rice, potatoes and sugarcane. Similar to Chile, Costa Rica also grows biotech crops for seed production to export to Canada and the United States. In 2016, Costa Rica grew over 500 acres of biotech cotton, soybeans, and uniquely, a GMO pineapple with high antioxidants. In addition local scientists are developing and testing an herbicide-tolerant rice and GM bananas that are resistant to black Sigatoka, a plant disease that can lead to 50 percent or more yield loss. Honduras increased its GMO maize cultivation in 2016 by 13 percent over 2015, cultivating more than 95,000 acres. Honduras grows GM maize for consumption, as well as for seed, exporting GM maize seed to Colombia. It is estimated that since 2002 farm income has been enhanced by biotech crops by $3 million. Honduras also imports GMO feed for their livestock and aquaculture industries. In 2016 Mexican farmers cultivated nearly 250,000 acres of GM cotton and soybeans, and to date Mexico has authorized 158 events for import and consumption, including alfalfa, canola, potatoes and sugarbeets. From 1996 to 2015, Mexican farmers have gained $489 million in income by planting biotech crops. The International Maize and Wheat Improvement Center (CYMMYT) based in Mexico has been testing genetically engineered wheat, and new facilities partially funded by the Bill and Melinda Gates Foundation will enable further research in GM maize and wheat. Paraguay grew approximately 8.7 million acres of GM cotton, maize and soybeans in 2016. Paraguay is the third largest biotech producer in Latin America, exporting to Brazil, the EU, Israel and Russia. Over 95 percent of the soybean crop is biotech. Since original plantings in 2004, Paraguay farm income has increased by $1.2 billion. Finally, Uruguay is the tenth largest producer of biotech crops globally, growing over three million acres of GM maize and soybeans, with 98 percent adoption of biotech soybeans. Over the 15 years Uruguay’s farmers have planted biotech crops, their income has increased by $216 million. Uruguay exports its soybeans to Egypt, the EU, China and other Asian countries.